The RC10001 thirty-two bit microcontroller is a full featured processor core and peripherals. It is designed in a high-temperature SOI process to operate from -55ºC to 300ºC reliably. The part operates up to 4MHz. The ARM Cortex-M0 is the core processor. The ARM core contains a system tick timer, a watchdog timer, a nested vector interrupt controller (NVIC), register banks, and memory. Power control and sleep modes reduce the power consumption. The Cortex-M0 uses the advanced Thumb-2 instruction set. Peripherals include a UART interface, a SPI interface, a LIN interface, four timer/counters with one capture input and four match outputs, a real-time counter, and up to ninety general purpose input/output (GPIO) pins. 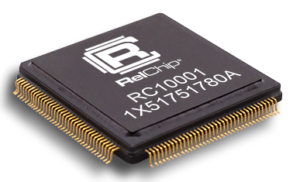 The RelChip™ RC10001 32-bit ARM Cortex-M0 microcontroller is designed for extreme environment applications such as down-hole oil, gas, and geothermal applications, automotive, aerospace, industrial control, and utilities.